A decade from now, the children recently exploring the “TriHy” at the Discovery Museums may be asking their parents for vegetable oil-fueled cars. And that’s the mission of the triple hybrid vehicle built by Boston-local engineer Max Hall, which sat in front of the Discovery Museums’ Science Center on July 23 as part of the Progressive Insurance Automotive X PRIZE National Education Program. 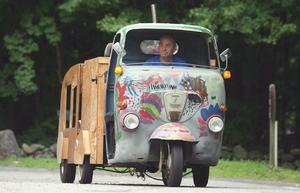 “You can practically put bacon fat in it and it will be happy,” said Hall, builder, owner and proud user of the “TriHy.” Its skeleton consists of a 1967 Italian three-wheeler with a trailer attachment that holds the battery charging engine and exhaust mechanisms all designed to model the teardrop trailers of the 1920s. The vehicle’s visit was part of the Progressive Insurance Automotive X PRIZE National Education Program which shadows the ongoing X PRIZE competition in Detroit where $10 million in prizes will be awarded to teams that create “clean, production-capable vehicles that exceed 100 Miles per gallon or energy equivalent,” according to the X PRIZE website. Acton’s Discovery Museums were one of several national locations, though the only in New England, which were used as a platform to educate both children and adults on the local and universal needs of alternative energy and fuel efficiency. “[The education program] is all about teaching youth about fuel efficiency through hands-on programs across the country,” said Julie Feldman, co-coordinator of the event in Acton. LeBlanc pointed out different sections of the museum where children could experience the different mechanisms used on vehicles, and each of the play stations raises the question, “what’s that got to do with energy?” and it does connect in some way But the best method is for the children to discover the answer on their own and the staff of the museum are there to help them in the right direction. In one space in the museum, kids could participate in the “Making the Wheels Turn” competition where they must use only Lego’s to build the best model fuel-efficient car. “Ten or 20 years from now we want our kids thinking about this, and we want them to start thinking about it now,” said LeBlanc. The Discovery Museum also hosts traveling science workshops where they go into the local elementary schools and coordinate lessons with the school’s curriculum to teach about some of these issues — like fuel efficiency, clean energy, and ways to conserve energy.